Final Fantasy video games have long dazzled us with their state-of-the-art computer graphics. Back in the 8-bit days of pixelated sprites, they charmed us. So here's a fun look back at Final Fantasy graphics, a celebration of how far computer graphics have come in the past 20 years. In the graphics survey below, I've neglected Final Fantasy spin-offs and sequels on hand-held consoles and phones, because there's so many FF releases that by the time I'd finished reviewing them all, a new Final Fantasy would be released. Note: All Final Fantasy games are © Square-Enix (or, originally, Squaresoft). 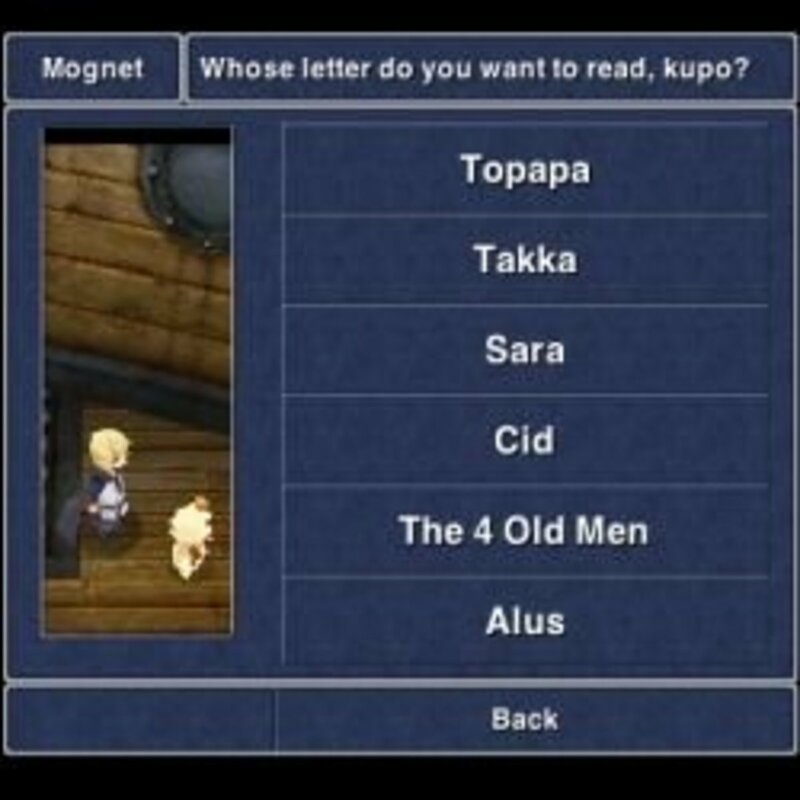 Screencaps from games on this page are believed to be Fair Use for purposes of commentary and critique. A long time ago on Famicon and NES: adorable pixelated sprites! I remember the tedium of having to program sprites in binary, when there were only white, black, red, green, and purple in hi-res graphics. I think by this time we were up to a whopping 128 colors -- woo hoo! -- and something like 640x480 resolution for a standard computer screen. It looks primitive now, but these were about the best graphics you could get back then. Battle formation for about the next ten years: Everybody stand in a line... say cheese! Trivia note: did you know that Square actually patented the Active Time Battle system and menu layout? Here's the diagram for Final Fantasy's ATB patent. Cool! 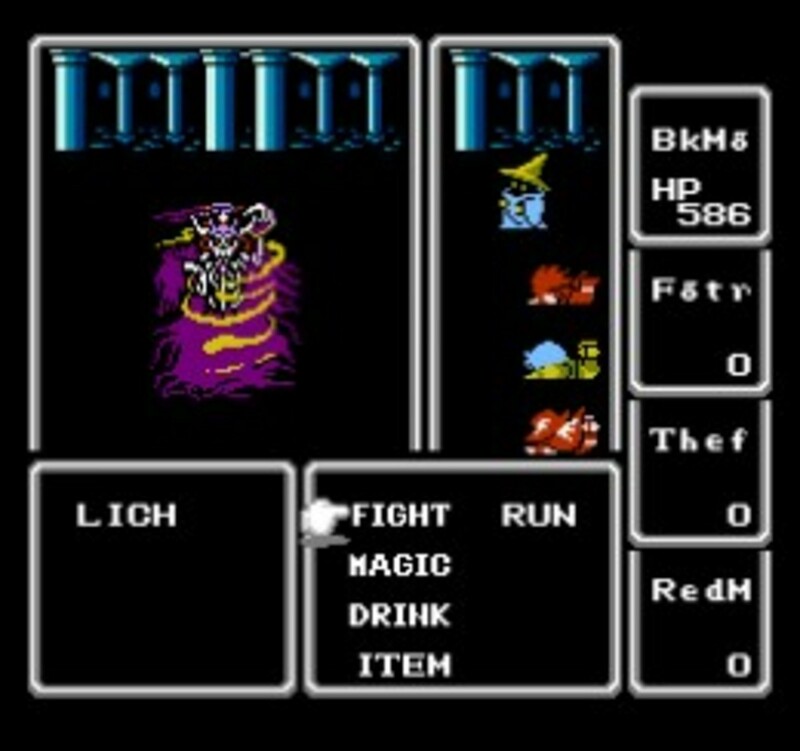 Below is a video clip showing the 1990 Nintendo (NES) port, the first Final Fantasy game available in English. The graphics are identical to the original Famicon version. For more screencaps from the original Final Fantasy game, see this fantastic Final Fantasy I Shrine / Walkthrough with lots of screencaps. Also notice the Main Theme of Final Fantasy, present from the beginning. Nobuo Uematsu has made Final Fantasy sing for 25 years. Confusingly, Final Fantasy II and III were only released in Japan until recent remakes. Final Fantasy IV and VI were originally released as Final Fantasy II and III in the U.S. 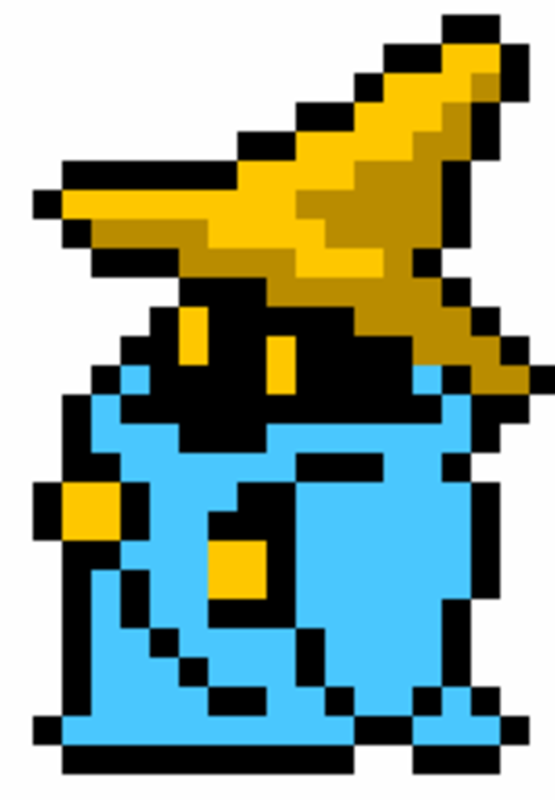 The original Final Fantasy II stars the main character of Firion, whom I call Mr. Cardboard since all his friends and most of the NPCs have more personality. 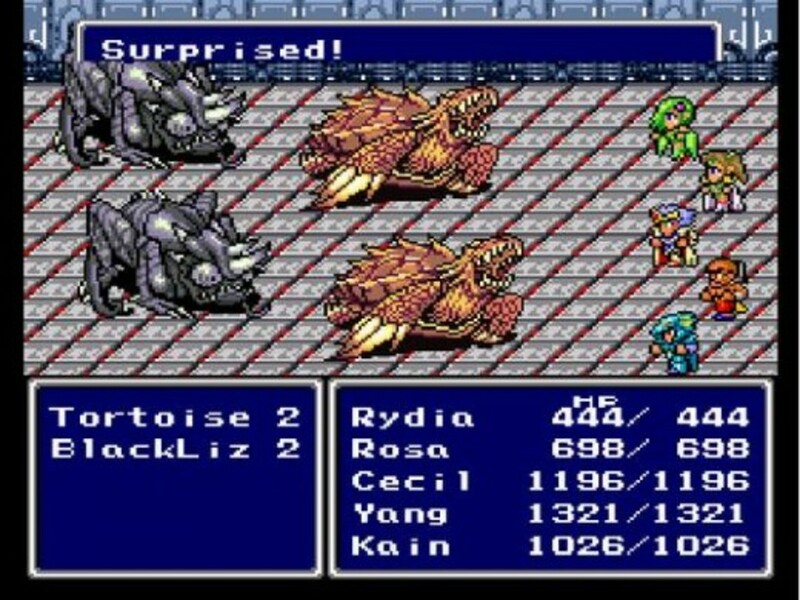 I think that Final Fantasy II really established the series, not least in the unusual premise that the numbered releases are not actually sequels of one another: they simply carry over, reinvent, and ring changes on the game system, building up a stock of recurring whoosiwhatsits like chocobos, black mages, summons, dragoons, -aga spells, and so on. More importantly, Final Fantasy II had PCs and NPCs with basic personalities and plot. (There's a lot of FFII in FFXII, from Princess Hilda/Princess Ashe to Leon/Gabranth). Below are the original 1988 graphics compared to the iOS/Android remaster (which I loved). Also see this commentary/playthrough of the original FFII hacked with a fan translation, so you can see original gameplay. Four generic Warriors of Light, young orphans, bump into a glowing crystal that sends them off on a quest to save the world. The 2006 Final Fantasy III remake for Nintendo DS gives the four heroes a lot more personality (and names) and offers better gameplay with fun 3D retro graphics, but the original game of course followed closely on the previous two: stand in a line and say cheese! See my own Let's Play Final Fantasy III for a video of the original FF3 plus my own "revenge of the cute!" 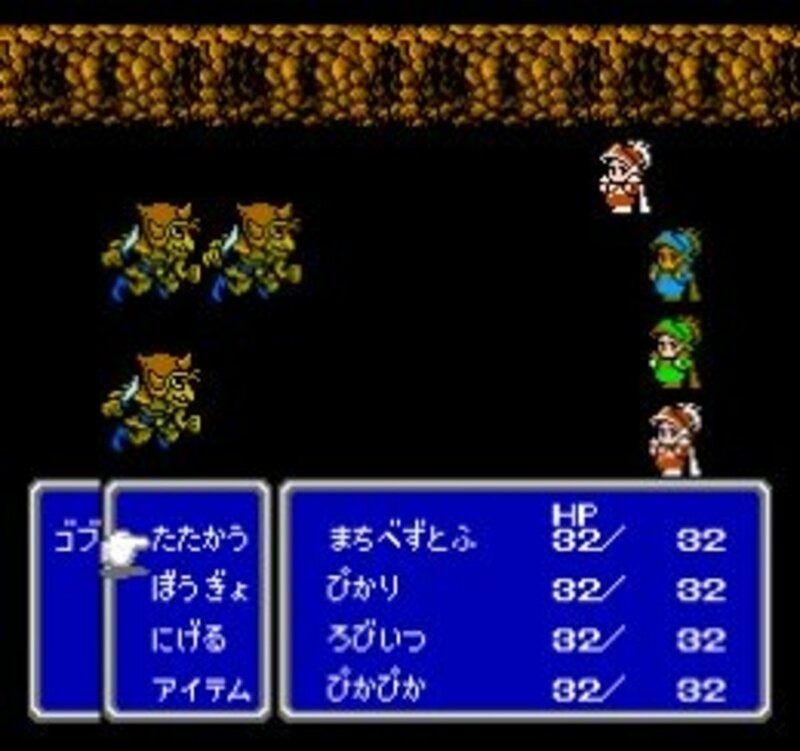 screencaps of the 3D remake, which was upgraded for iOS and converted the soundtrack from fun to fantastic. Final Fantasy "Title Screen" (now set after quite a bit of introductory plot and training battles, as is common in many FFs). 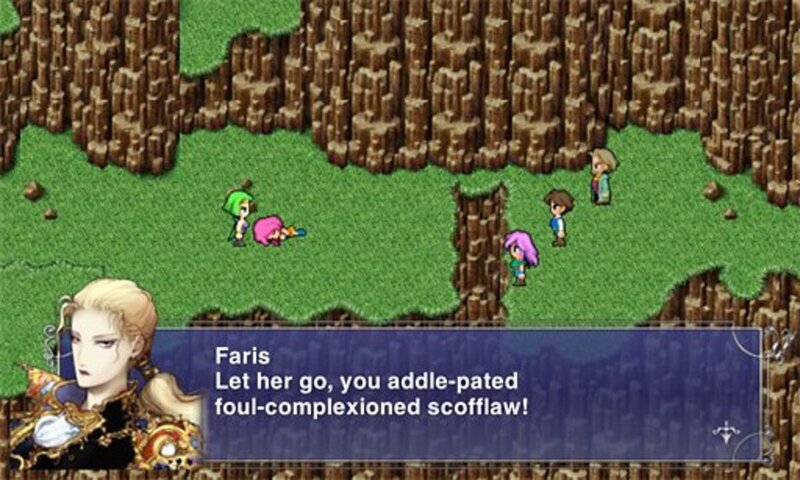 With Final Fantasy IV, Square began experimenting with more realistic ways to represent the setting and world. They tried different angles, different views depending on the needs of the scene, and more elaborate backgrounds. Character sprites in Final Fantasy II had shown some individuality, but now they began to wear costumes (III had job class sprites, but not unique PCs) that represented character and personality. As I noted above, Japan's Final Fantasy IV was originally released in the U.S. as Final Fantasy II, easily recognizable by Rydia's green hair. 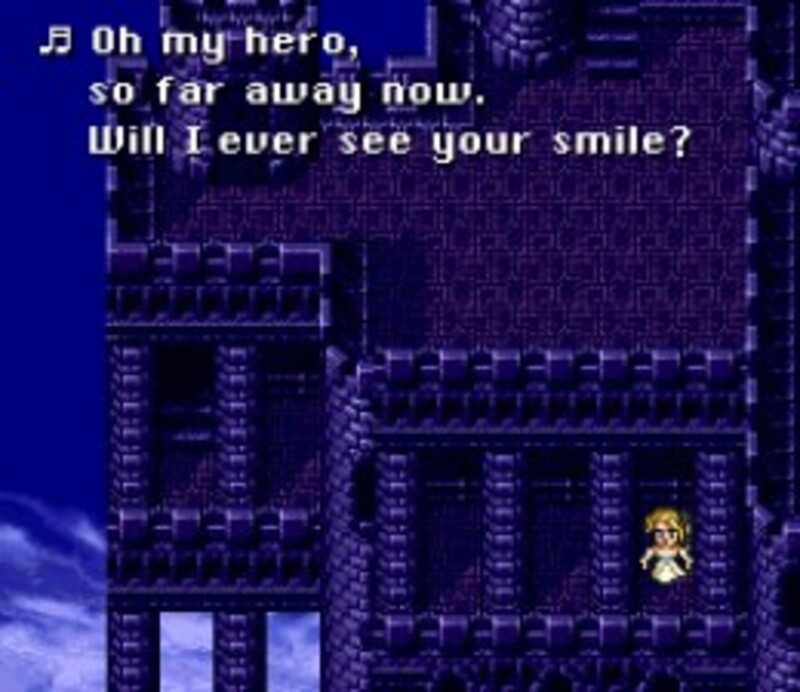 FFIV received a dramatic 3D remake on Game Boy Advance in 2004, recently ported to iOS, using the original storyline while improving graphics and gameplay, fleshing out characters with thought balloons and motivations, and adding voice acting. Below is another video walkthrough of original FFIV (English version, FFII) by HC Bailey. Skip ahead to about 2:00 for an example in-game battle scene. 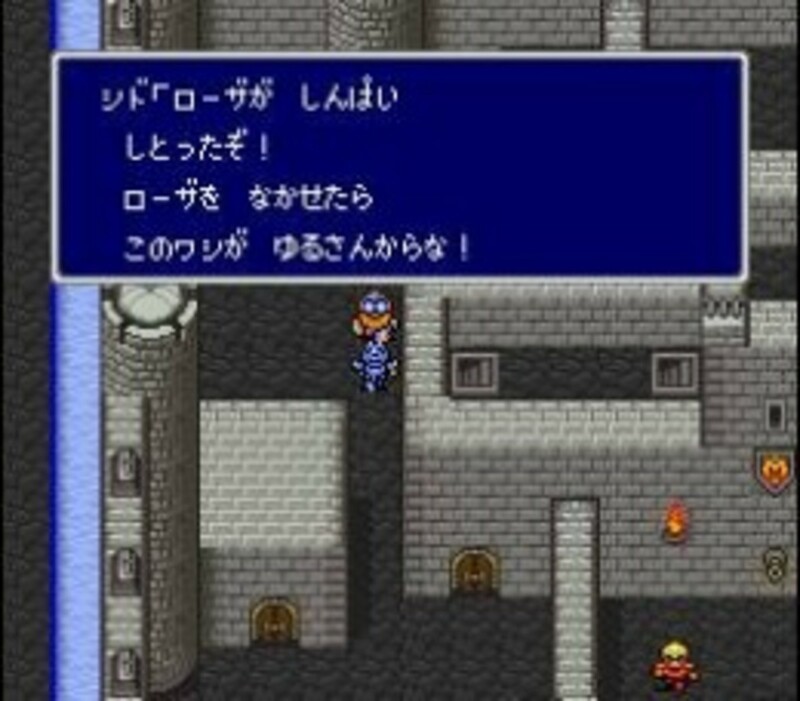 The English localization now calls the main character of Final Fantasy V Bartz, but the earliest translations called the poor guy "Butz". 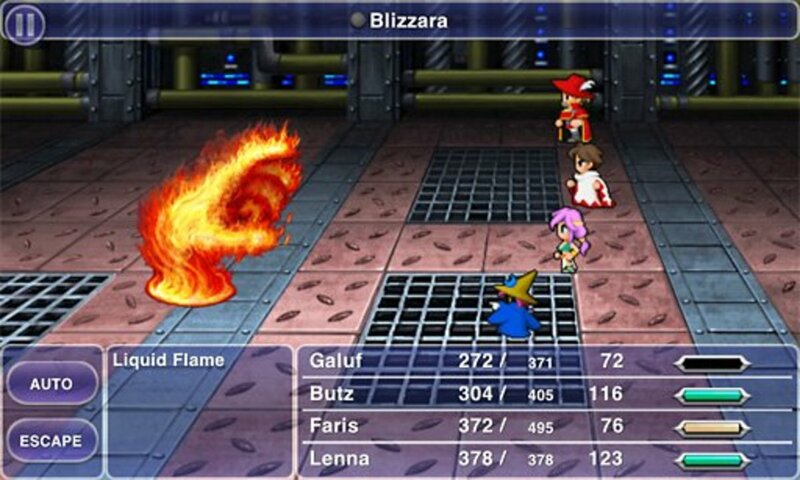 Following the trend, FFV was re-released on Game Boy Advance in 2006 (with VASTLY better translation than the PS1 "Final Fantasy Anthology" version). Slowly but surely, the game environments and characters were becoming more detailed, with more head-scratching, finger-wagging, eye-popping and other body language. This game also added even more special effects like shimmering forcefields, shooting sparks, walls (or at least tufts) of flame. The iOS remake has clearer graphics and the zany GBA translation, but unfortunately, everyone's been stretched vertically like Fisher-Price people. There's also a surreal mismatch between the in-game sprites and Amano's concept art portraits on dialogue boxes. 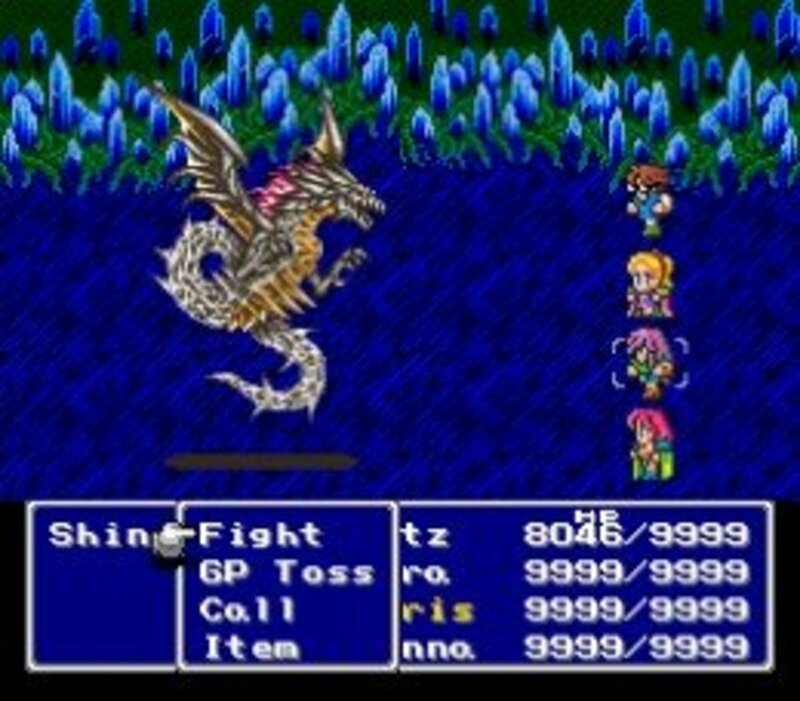 Here's the final boss battle for FFV with the original graphics. 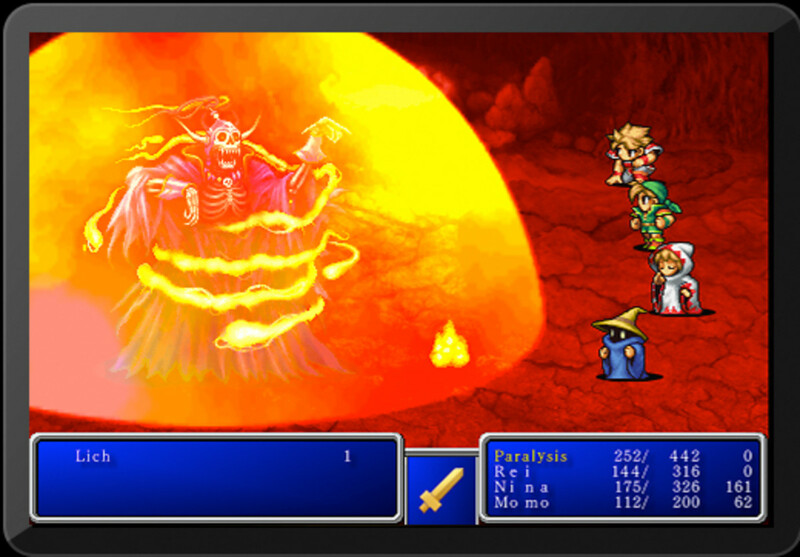 Yes, obligatory cracktastic landscapes for the ultimate showdown are a Final Fantasy tradition! FFVI came out a year after photo-surrealistic MYST was released: but then MYST was basically a glorified (and marvelous) slideshow stitched together, whereas RPGs like Final Fantasy were doing things realtime. This is why pre-rendered FMVs look so much better than in-game graphics. But FFVI hadn't gone the pre-rendered route yet (at least, prior to the 2007 Final Fantasy VI: Game Boy Advance Remake). However, in-game graphics were going along by leaps and bounds. 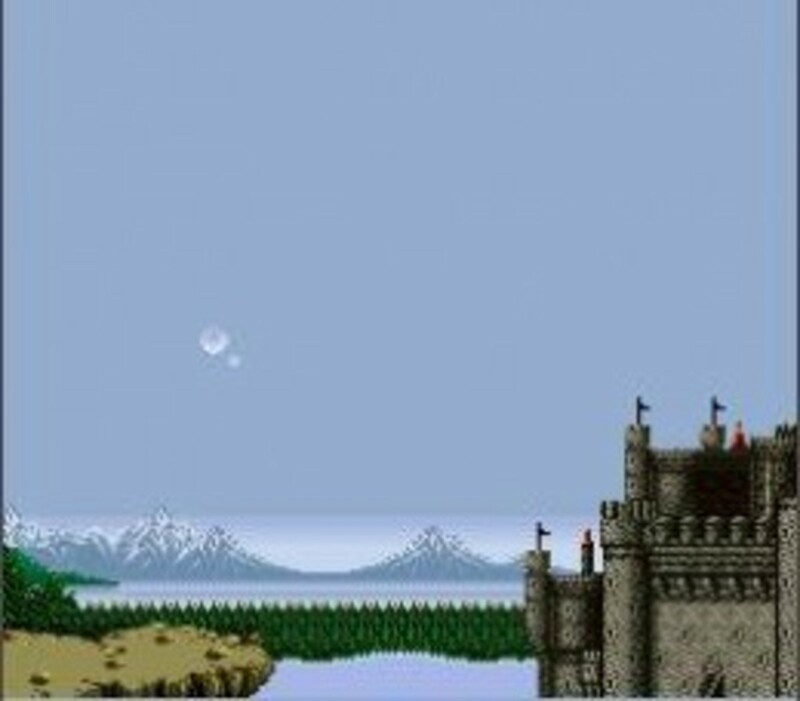 Final Fantasy VI was the last of the "old school" Final Final Fantasy, pixellated sprites placed against a background with as many effects and gestures as possible. 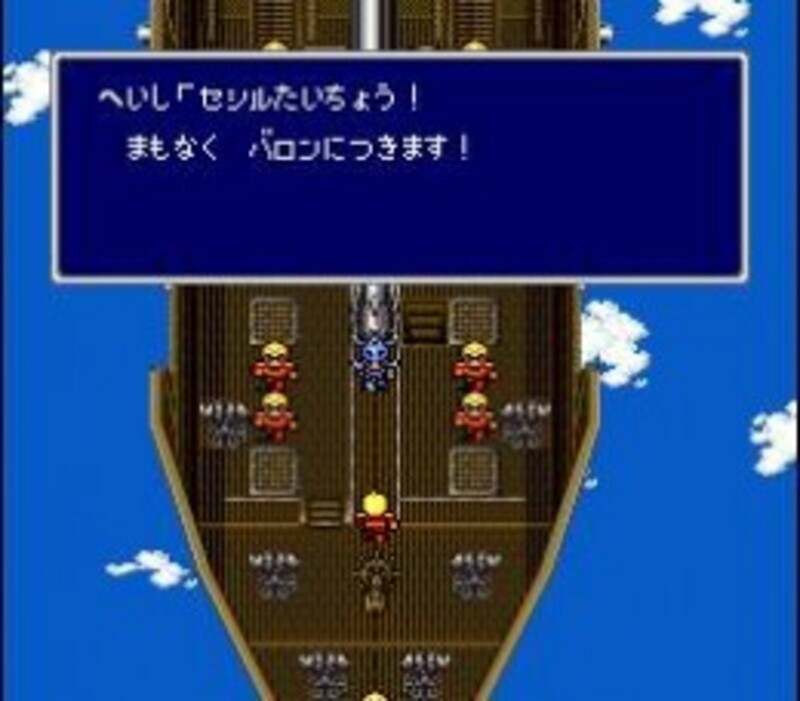 Riding chocobos, the opening cutscene, and a few other cutscenes experimented with a kind of bird's eye 3D perspective also seen in FF5's closing FMV. The original intro to FFVI is quite epic even without the remake's CGI. Note the faint echoes of FFVI in FFX: it's almost the anti-FFVI, as far as "1000 years ago, magic, no, wait, machina, was abolished." I think this may be the PC edition, which smoothed pixels and rendered polygon data better. Old-school gamers hated it. A new generation of gamers fell in love with it. Twenty years later, Square-Enix is still milking the wildly popular game and world Final Fantasy VII. For the first time, physical 3-D models of characters were being rendered on the fly, so that you saw different sides of their heads, limbs, arms as they turned and gestured. Backgrounds were somewhat 3D as well. As this demanded a lot more of the game engine, the graphics almost look simpler than the pre-drawn pixellated sprite predecessors of old school games. It was a start. 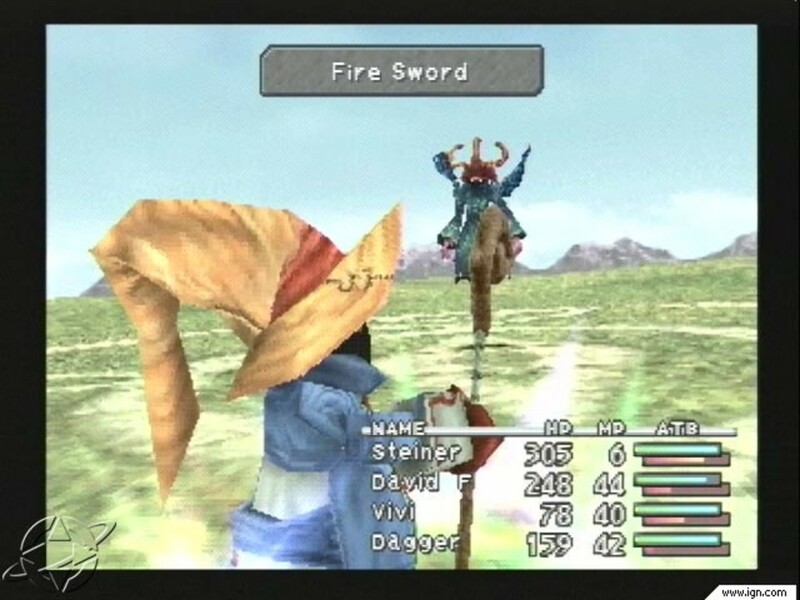 There's an odd mix of graphics here: in battle, the characters are fairly realistic, while the field map (wandering around exploring) and in-game cutscenes use large-headed small-bodied chibis, and then the FMVs do a more realistic, pre-rendered version that's closer to the battle models. From Final Fantasy VII onwards, lengthy and over-the top summons and "limit break/overdrive" animations also became obligatory. Final Fantasy VIII is one of my favorites, although a lot of folks hate it. 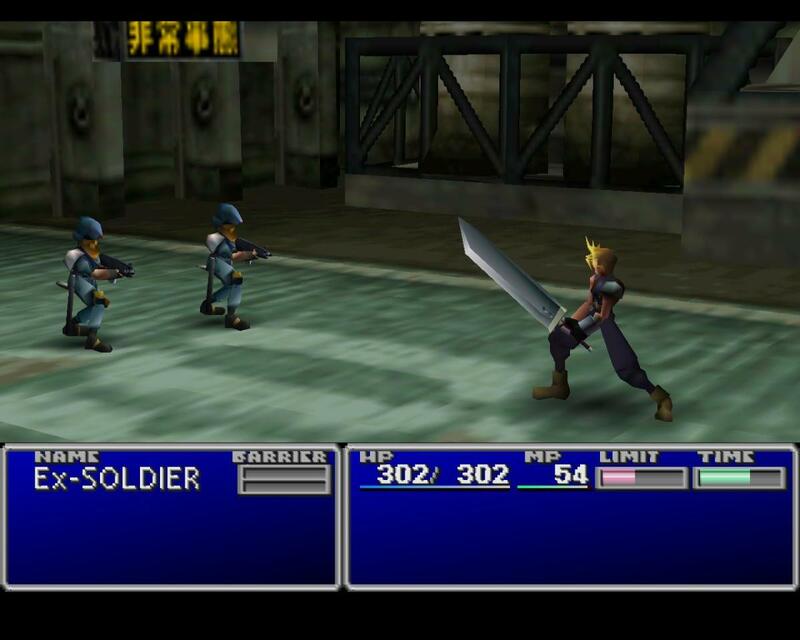 The graphics were like the battle scenes for Final Fantasy VII: realistically-proportioned polygon people. However, the details on clothing and faces were better. There was an interesting juxtaposition between real-time rendered 3D polygon characters and lavishly drawn backgrounds which were 3D images, but like the background cells of a good animated movie. 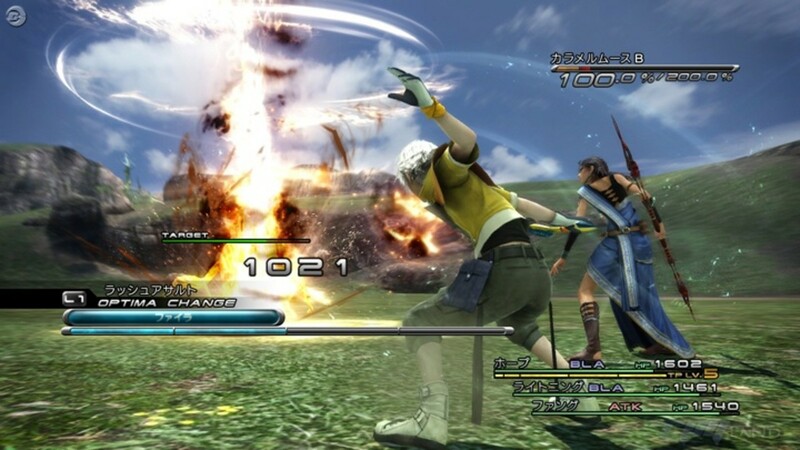 Animation was now becoming a major part of Final Fantasy. It was already there in bits and snatches in FFVII, with Cloud imitating Zack's push-ups and various characters snapping fingers, exhaling in relief, or wiggling with laughter, or chocobos dancing. 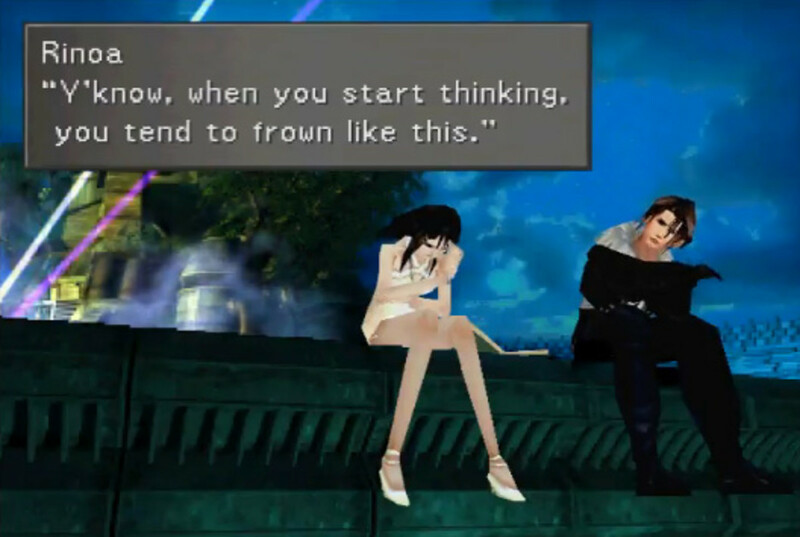 But in FFVIII, characters really had physical mannerisms, to the point that Rinoa could drive Squall nuts by mimicking his mopey body language. Even Sorceress Edea's window treatment seemed to have a mind of its own (the flapping veils suspended from an odd frame behind her shoulders). And of course the FMVs had by now become quite epic, although the gulf between pre-rendered cutscenes and in-game graphics was as wide as it would ever be. After two games of dystopic urban grunge, old Final Fantasy fans were buzzing like hornets over the move away from FF's sword-and-sorcery D&D roots. Squaresoft heard and delivered an old-school style Final Fantasy game with the latest 3D graphics, complete with oversized heads: Final Fantasy IX. Predictably, the attempt to give the fans exactly what they wanted met mixed reviews, although I think in recent years, it's been embraced more by fans. 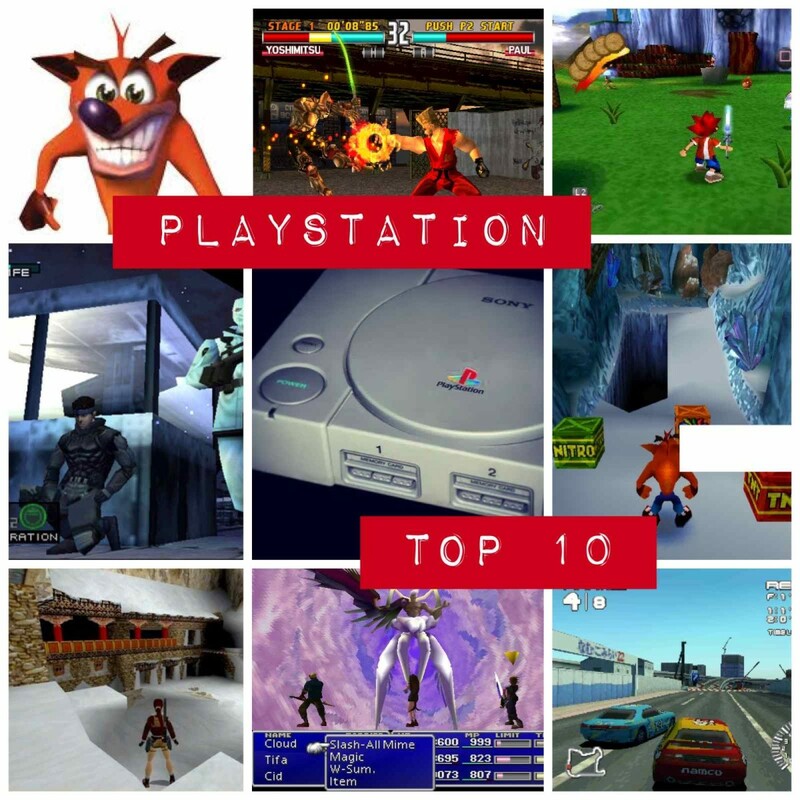 It was also the swansong for the PS1. It pushed that old graphics engine to the max, with floating camera angles, excellent animations, and about as much visual detail as you could cram into a realtime, traditional Playstation I game. Zidane's tail punctuates the fact that animation and movement had become integral to FF graphics. 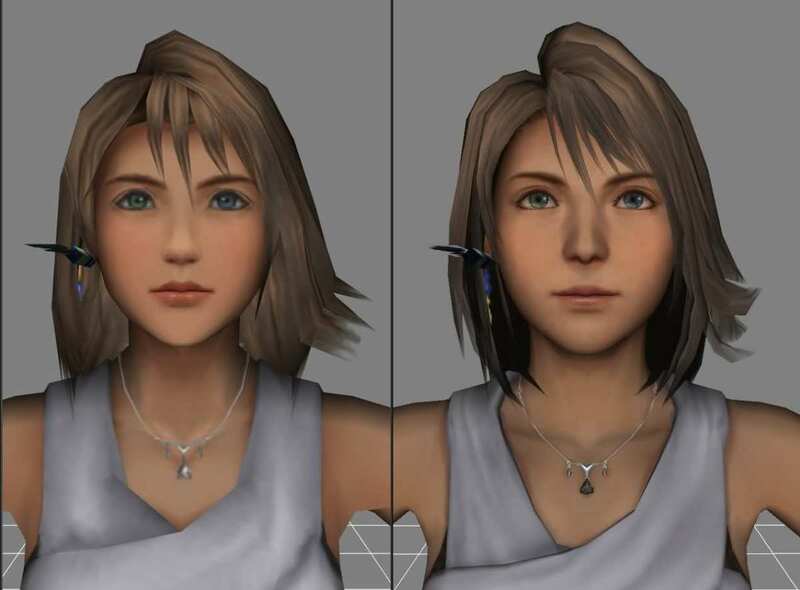 "low polygon" vs. "high polygon" models of Yuna in original PS2 Final Fantasy X. The Playstation 2 game engine was the first built to handle realtime 3D graphics of the type dimly attempted in Final Fantasy VII. Final Fantasy X blew us away. To underscore the fact that 3D, realtime graphics were now possible, the opening cutscene dispensed with the usual pre-rendered FMV, and dropped us into actual in-game graphics. "Low polgyon" models were used for regular gameplay and most cutscenes, but for key moments when emotion and facial expression were important, the in-game graphics would jump to "high poly" for closeups. There were some casualties, too. 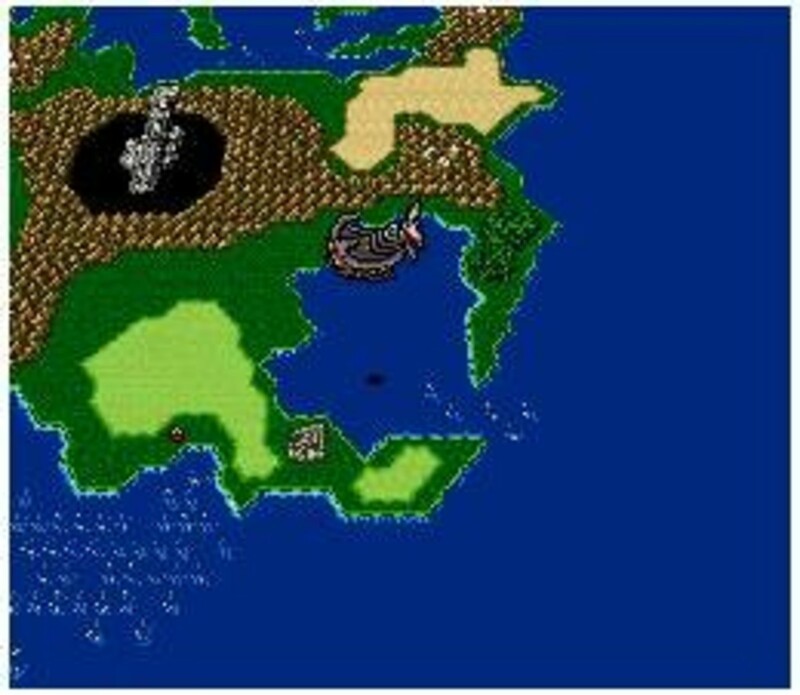 With old bit graphics, it was cheap and easy to tile a vast world map and let you run around on the map with a representative icon of your airship, chocobo, or character sprite. Now we lost the overhead world map and just chose destinations from a static map with a menu. However, on the ground, we had a 3D character running in actual 3-D, fully rendered environments. Camera angles were pre-set and could not be changed, but changed in battle. FMV graphics in original and remaster were pre-rendered, so they could look fairly photorealistic. 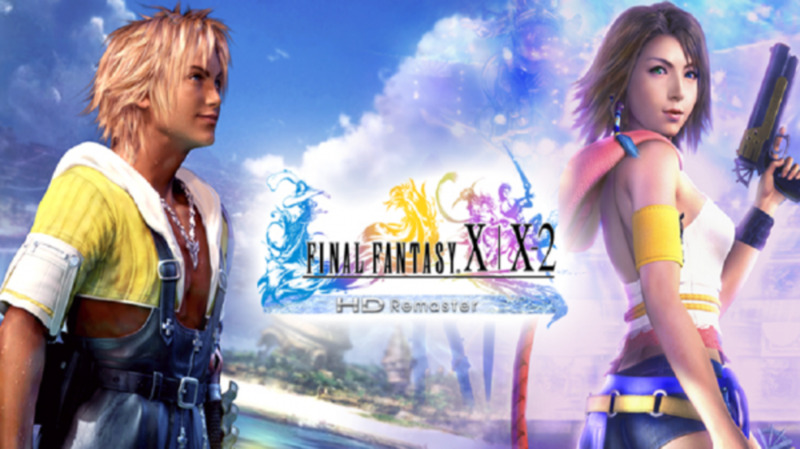 In 2014, Square-Enix released a long-awaited HD remaster of Final Fantasy X, with models and textures rebuilt. On the one hand, the HD backgrounds are gorgeous. If you remember how fuzzy the game looked back when we were stuck using fuzzy old CRT televisions, before the days of LCD screens or emulators, it's an astounding change. On the other hand, the character faces suffered. I think they started with the "low poly" models and upscaled them, to be consistent across the board— after all, none of the npcs had "high poly" models. However, I preferred the "high poly" models of the original game. 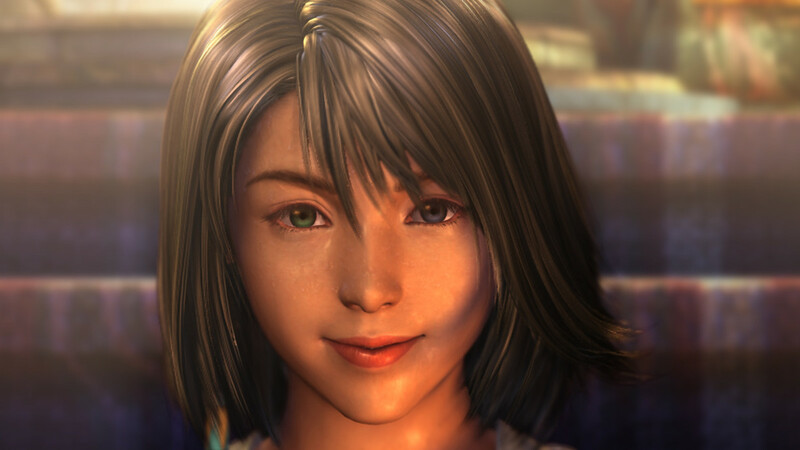 Worse, the facial expressions lost some emotion in the FFX remaster. 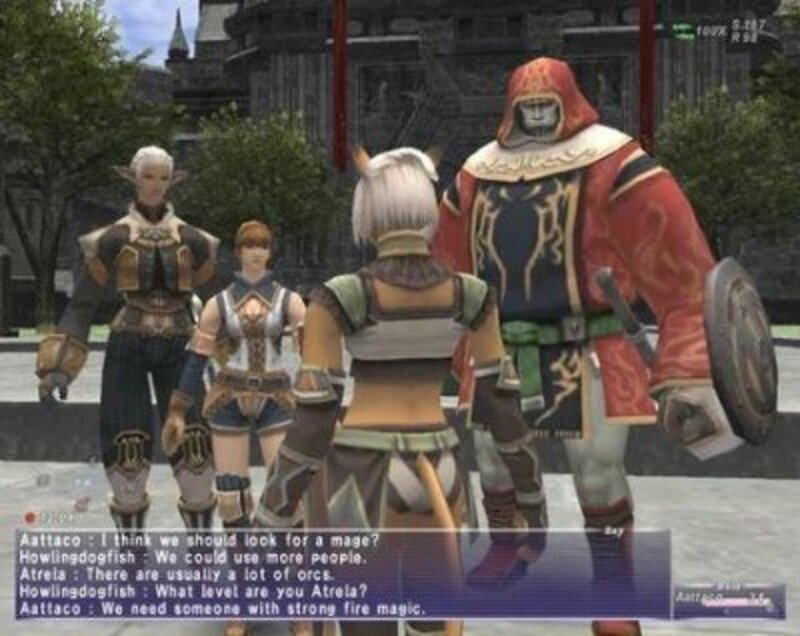 At long last, Square and Final Fantasy XI joined the world of online gaming, going up against Everquest and WoW. It had decades of game mechanics, design, and details like chocobos and summons to draw on. It also had the PS2 game engine. This was just powerful enough to let it take Final Fantasy X style graphics (improved, as ever, with each new FF iteration) and let the realtime engine interact with other people's characters and AI monsters, summons, and a rich 3D environment. 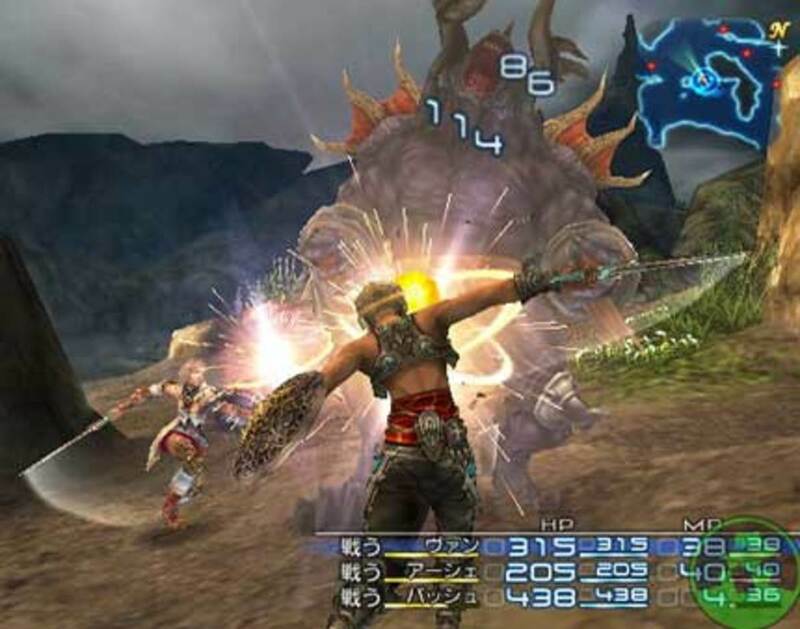 All the 3D, realtime, free-range-of-movement, camera-controlling goodness of FFXI was brought to bear in this the most visually complex of the Final Fantasy games on Playstation 2: Final Fantasy XII. Like the old PS1 games before it, the mastering of graphics allowed Square to indulge in copious amounts of worldbuilding: you can literally take hours to have your character run from one side of the continent to the other, with shops, cities, caves, and lots of nooks and crannies to explore. This came at a cost: unlike old-style bit graphics, every room and area required hours of development and rendering. 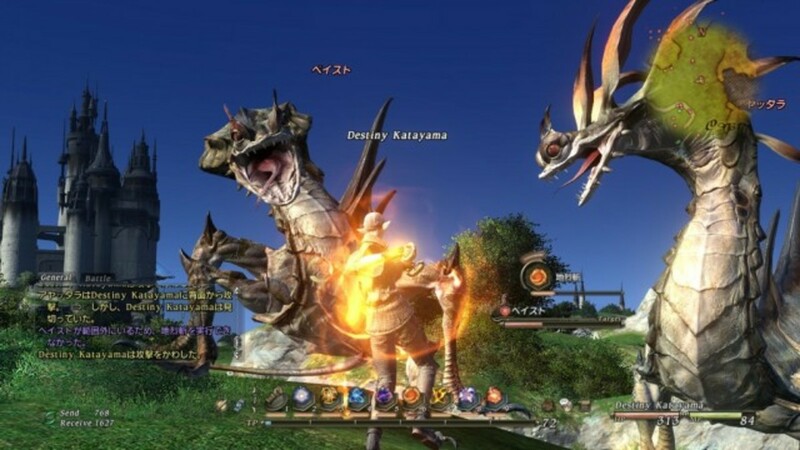 The only complaint I have about the graphics of this game is that critters that were beautiful in previous games (coeurls, chocobos) suddenly got hit with an ugly stick. 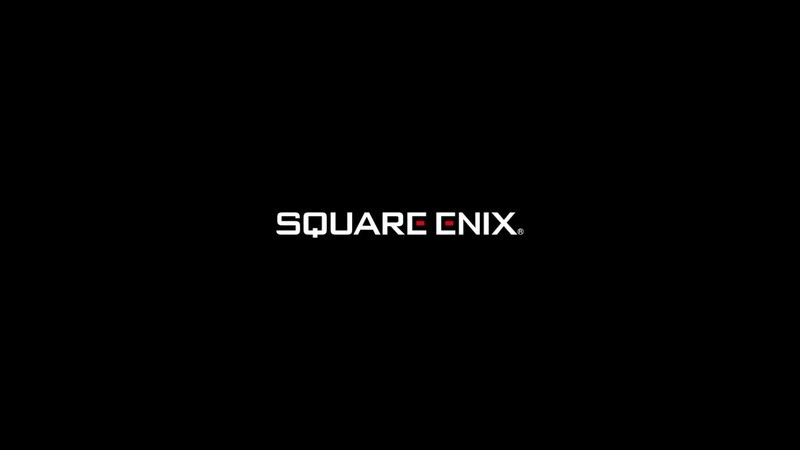 22 years after the first whimsical sprites first appeared under the Final Fantasy moniker, Square-Enix -- now with very few of the original crew left -- launched into the brave new world of Playstation 3 and XBox360 with Final Fantasy XIII. Lordie lordie, how far we've come. Fabric that moves naturally, weather and water and motion capture that's getting close to realistic, photo-realistic fabric and skin textures, tons of animation going at the same time: we take it all for granted, but just a few years ago, this was the kind of animation where you'd do a rough skeleton of the animation on your work station, plug in all the textures and lighting parameters and other variables, and then leave your state-of-the-art renderer to crunch the numbers all night long and deliver you a finished animation (you hoped) the next morning. That's how animations like Gollum in the Lord of the Rings films were done. The PS3 is doing it as you're playing, and doesn't break a sweat. The only problem is that this does come at a premium: a gazillion hours of graphics design and testing. Therefore, while it's extremely well disguised, we're back to "everybody pick a spot to stand during the battle and say CHEESE!" (but not in a line, at least). More importantly, since it takes enormous amounts of work to design the graphics and 3D environments, they are only there for plot and movement... there are no side quests until late in the game, almost no shops or rooms to putter around in, and no recurring npcs: you'll never be able to go back to a town and see how the resident barfly is getting on, e.g. You are playing a role in a movie. A gorgeous, Avatar-rich 3D environment and movie, but still. It's a different kind of gameplay. As a graphics aficionado, I adore it. But I can understand those who want more freedom to chart their characters' choices and explore the world. Tip: this game is best played with good cover-the-ear sound-reducing headphones. It takes immersion to a whole new level. FFXIII looked great. The next challenge was creating graphics of that quality for an MMO, where there may be dozens of characters on screen all performing complex attacks, spells, and gestures controlled by players around the world. Final Fantasy XIV had a rocky beginning, enough that Square-Enix revamped it extensively and put a ton of work into addressing early criticism. The version people are now playing is almost an entirely new game. From everything I have heard and seen, Squeenix has more than redeemed FFXIV, making a rich, vibrant world, with intricate 3D landscapes, well-crafted arms & armor and costumes to suit player tastes, plenty of gestures, fantastic special effects. I gaze at screencaps from Tumblr friends (mostly Livvy) with awe, and I'm afraid to play it lest I never get anything done. About the only complaint I can see is that people look a bit plastic, due to simplified skin textures (streamlining, I assume, to speed up rendering when lots of characters are onscreen). "Pull a George Lucas." Heh. Good phrase. And yes, it's not so great when the "fleshing out" consists of realistically boring people. Sadly, my first exposure to FFI-IV was through the iOS editions, so I don't have the context to feel the differences quite as acutely. It will be interesting to see what happens with the Final Fantasy VII remake. Glad to see some love of XII in the comments. One of my favorite next gen FFs. I've been a fan of the series since the original FF. Younger gamers, especially those jumping in over the last 5 years or so, probably will never really understand the leaps in graphics from 1990 to today. I remember my friend and I getting so amped flipping through previews of Final Fantasy VI (III) in Nintendo Power, thinking how much better it looked than FF IV (II). Each new edition to the series always felt like a huge jump forward in technology. One thing I don't like though, counter to the complaints with FFXIII, were the larger worlds. More so, the larger towns. Too much tedious walking with exploring leading to sub-par reward for your time. One of the reasons I'm not a huge fan of FFVIII (on top of the cheesy love story). Fleshing out the world is great to a point, but it can also get pretty banal. This problem is not unique to the new FFs, many open world games are a turn-off to me. Why I loved Dragon Age: Origins, but couldn't get into Skyrim. I've played through ffvi, vii, and viii. and ffviii was by far my favorite. the character development is incredible and the cut scenes? amazing. ffvi also had good character development, but lacked graphics. ffvii was awful in my opinion. I so love PSX era Final Fantasy games, with their pre-rendered backgrounds, text-based(only) dialogues, comedy and emotional depth, etc. If only Square-Enix could just think about going back to their roots...and just dream it up again, you know? PS. : My favorite game is FFX, regardless of which console. Nice detailed lens, but old school gamers didn't hate FF7. They just didn't like how the story is quite linear when compared with older FF games where there are several endings. Final Fantasy VII (US) is still the best game in the series. I wish they would release either an updated version or a sequel. @anonymous: My favorite was X for the same reason yours is IX: I prefer fantasy with a little tech thrown in rather than tech with fantasy thrown in. It seems like they alternate from game to game, with XII being an odd exact balance between the two halves. My favorite of the sprites is V. Captain Faris is such a ridiculously fun character. The early games just don't take themselves very seriously! FFIX was my favourite. That and XII. I got into the FF series during the PS2 era, so VII was way over-hyped to me. I prefer my RPGs to be sword and sorcery, with techy bits added on - IX and XII do that perfectly. There may be techy bits in cutscenes and the like, but it doesn't affect the overall gameplay. The punky-punk settings of VII, VIII and XIII just don't appeal. It's called Final Fantasy. Not Final Science Fiction. Of the sprite series, IV is my favourite. The characterisation and story are both amazing. Saying all that, though...the only FF I've actually completed, (and by completed I mean defeated the end boss, watched the end cutscene, seen the end of the story) is FFI. The first one. All the others, I haven't yet got that far. The closest I got was fighting Jecht in X...before realising I was horribly under-levelled, and hadn't a whelk's chance in a supernova. Still, love the series. Final fantasy Vi (or III as released in the U.S) was my favorite. The storyline trumped every other one I've played over the years. The post-apocalyptic feel to the game was way before it became a popular theme. The graphics were not the greatest, though the creators did well with what they had. Great compilation. I'm a FF fans and I know all of the games you listed. Thumbs up!